Marketing is considered to be the bloodstream of any company. This is a profile that happens to be driving the business of the company. This profile is one of utmost importance to any company. It has been seen that in most of the companies the marketing managers are the people who are drawing the maximum amount of salaries and hence are at a constant pressure. 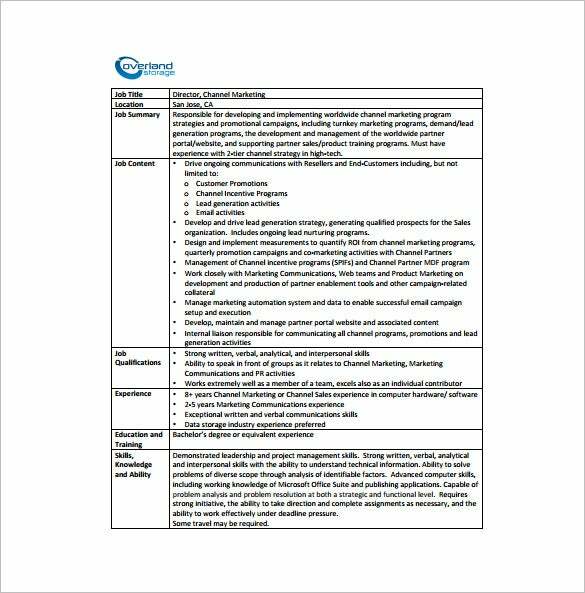 These types of templates can be used by the companies for the purpose of making some of the most impressive job descriptions for the position of the marketing manager. These templates are provided with great technical features and can be downloaded with immense ease. 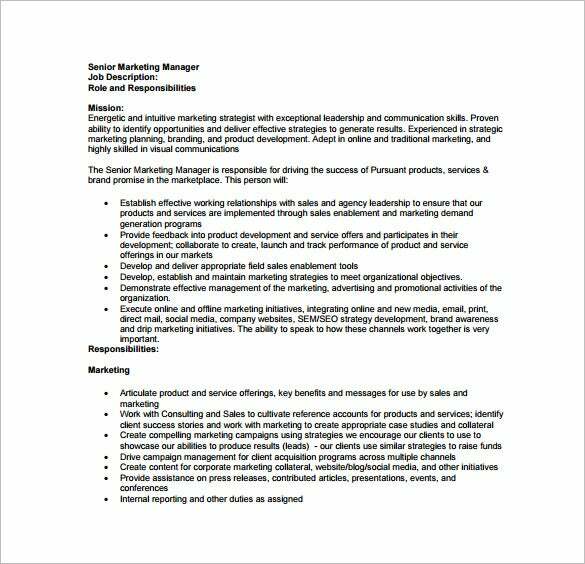 Senior marketing managers are very senior and responsible profiles. Quite clearly their jobs will also come with a lot of variation. These formats can be downloaded as they support in depth and detailed information. The resolution range is high and the templates are fully editable. The templates are perfect to create a profile for a marketing manager for the social media companies. 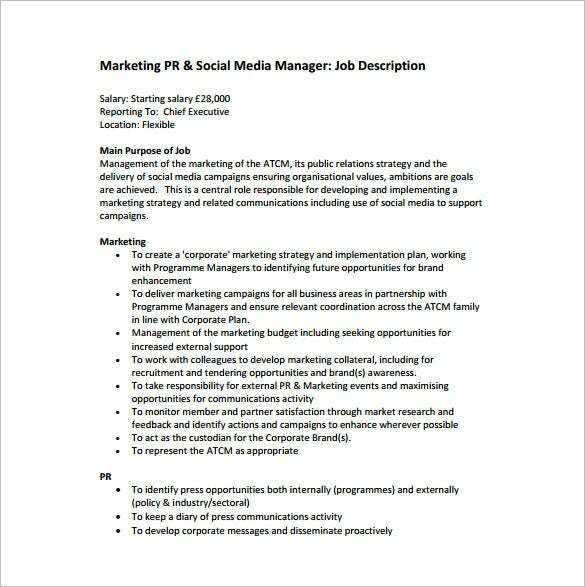 Various social media and networking companies can download these formats for the purpose o creating a winning marketing manager description. These template designs offer a lot f variation and supports both table formats and paragraph style of writing. 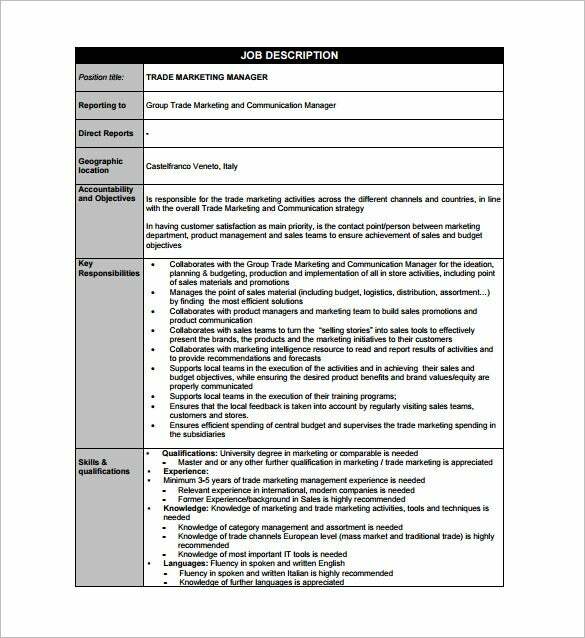 The templates are provided with a design that can support the information of the key deliverables of the position of marketing manager. 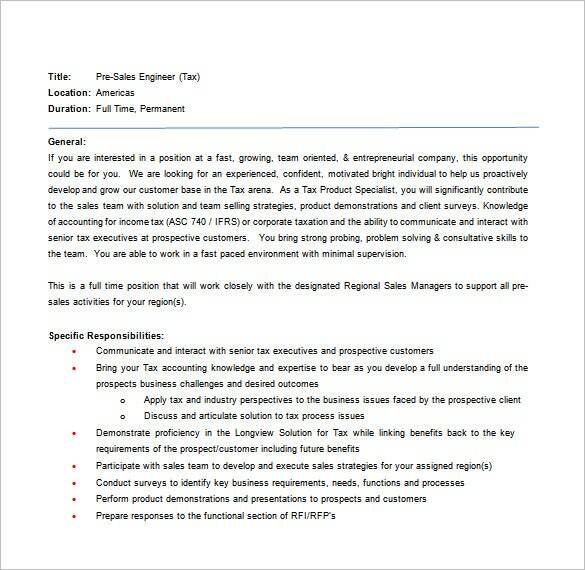 The templates will also serve the information of the reporting structure for the position and the profiles that will be a part of the team, under the profile of the marketing manager. The template has a great resolution range that helps to get a great printout quality. 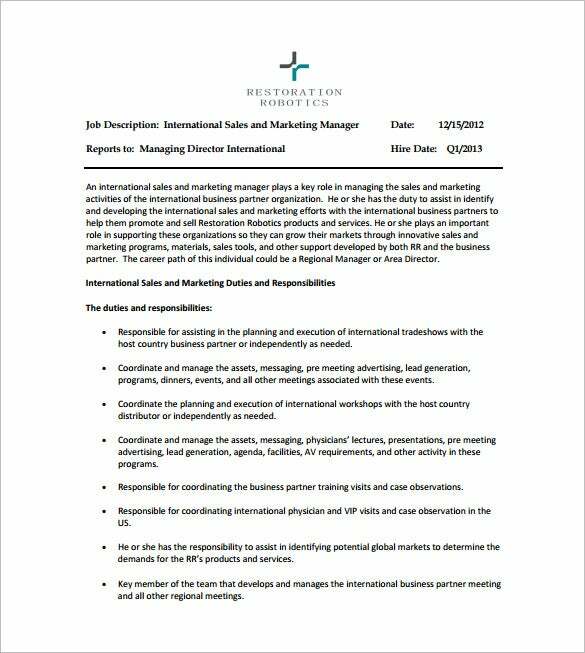 What is a Marketing Manager Job Description Template? 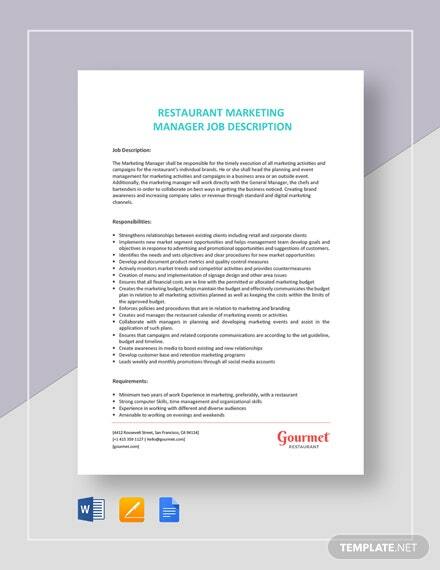 These are formats that can be used for the purpose of creating proper documents of all the job responsibilities and the deliverables that are supposed to come from a marketing manager. 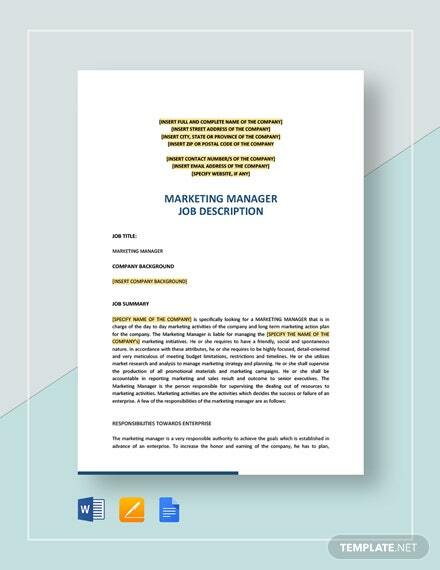 How to Create a Marketing Manager Job Description Template? Initially all the points are to be mentioned in bullets. Each point is then to be elaborated. 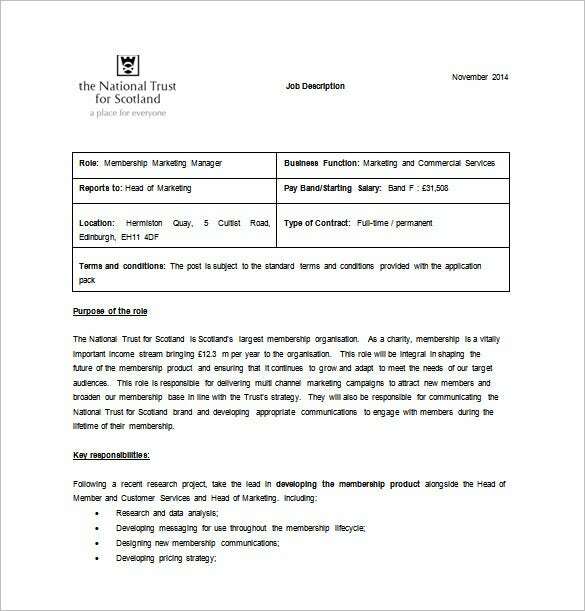 Do not add extra ad ministerial job as its will confuse the description. The biggest benefit of these documents is that it helps in the process of making a clear outline of the responsibilities of the profile. This helps to keep things clear for the management and also the employee. Marketing managers are very effective people for the company. Their role can be really crucial either in the success of the company or its failure. 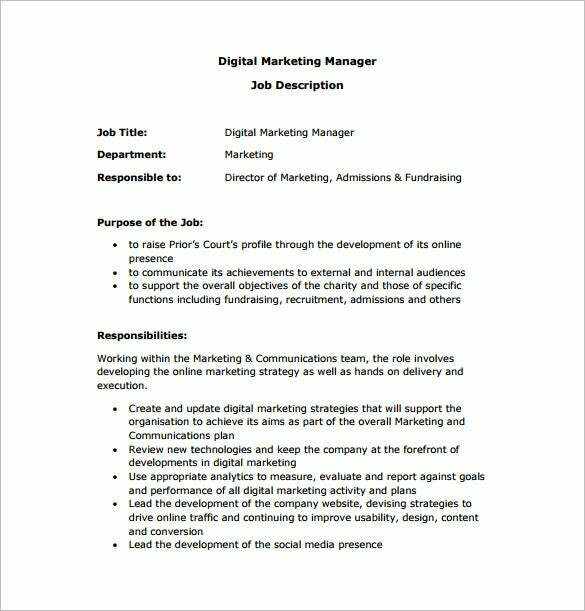 The marketing manager job description templates can prove to be an essential support in this respect.